By keeping the track of the latest market trends, we are engaged in manufacturing an exclusive range of Electronic Toll Collection System. 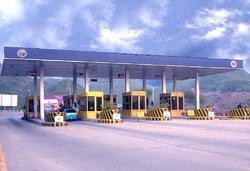 • Used to be installed at toll gate to collect toll tax. Arya Omnitalk is a leading player in Highway Toll Collections Systems & HTMS in India, having supplied & commissioned 220 toll lanes has joined hands with sanef its technologies, France is a world leader for supplying innovative Mobility and Toll systems. - Engagement of a contractor by MCD for toll collection at border points from specified commercial vehicles entering delhi. BE Toll Management System is a solution for the toll plaza management, which gives a systematic and effective means of collecting revenue. It gives a friendlier interface of the hardware. Basic version of toll collection system is useful in generation of toll fee ticket, proper accounting of revenue collected in each booth, generation of various reports based on revenue and traffic figures.